Can a Family Actually Do Missions on a Family Mission Trip? Have you ever considered taking your whole family on a mission trip? If the thought ever crossed your mind, this book is for you. Jill Richardson and her husband took all three of their children on an unforgettable mission trip, and everyone came home transformed in large and small dimensions. The tone of this extremely well-written book conversational. If you were hoping for a plan of action for the intrepid traveler, you may wish for a few printable checklists. You won’t find them, but what you do find will make it easy for you to make your own lists, and that is the point. There is no such thing as a cookie cutter mission trip. The author covers many issues associated with international travel.She also touches on the challenges inherent in the most domestic of adventure. The reader will find her advice to be thoroughly pragmatic, dished up with self-effacing humor. 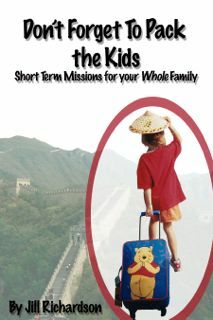 While thoroughly covering the practical issues associated with family travel, the author also methodically covers the discipleship issues unique to a family mission trip. One chapter is devoted to spiritual preparation, but the whole book is baptized into a spiritual perspective that will be invaluable to a family that is considering a mission trip for the first time. Are we sure we want to be missionaries? How do we know where Christ wants us to go? What exactly does it mean to share Christ in a country where there is no First Amendment protection of religious liberty? How can we possibly afford to undertake this trip? Should our family make this trip at this time? Two appendices focus on spiritual issues as well. The second appendix provides guides for family Bible study, but the first is the one that families likely won’t find anywhere else. It is a spiritual gift inventory to be used for every family member during the planning and preparation for the trip. Some readers may not think they need to be so formal in evaluating what each family member can contribute in service during the trip. After reading this book, they will almost certainly recognize that this inventory is an important part of the spiritual preparation to be an ambassador for Christ rather than a mere tourist in some place that is nothing like home. There is an excellent chapter on fund-raising. There is good guidance on the medical issues and travel documents. The author covers culture shock with real grace. She intersperses her commentary and information with stories from her family’s trip that even provide guidance on delicate conversational challenges; the author clearly learned from the apostle Paul how to translate local cultural elements into an opportunity for testimony. Regular readers of Living on Tilt well enjoy this family’s innovative approaches to making faithful Christian testimony in the most secular culture on earth. Readers must not skip the chapter on indicators that a family should not try to go on a mission trip. Every family needs to be honest with any evidence that now is not the time for such a venture. Jill’s family had a good time on this trip. They learned, and they grew. Jill’s advice rings true with my own experience trekking off to a strange culture in the name of Christ. Thank goodness Jill is the one trying to help you, because I would not have succeeded in being so orderly about it. Read Don’t Forget to Pack the Kids for guidance in creating your own plan for a life-changing adventure in service to Christ and to people he loves.